The UN Secretary-General started the 2017 Climate Negotiations with his opening speech. In his speech, the Secretary-General emphasized that the time is running out for both people and nature. He urged the representatives of countries and negotiating blocs to take necessary steps immediately and reminded everyone that the decisions they made would affect future generations. Negotiations in the first day were quite tense. The United States (US) and the European Union (EU) were faced with heavy criticism and their contributions to the Green Climate Fund and Intended Nationally Determined Contributions (INDCs) were not considered as genuine and trustworthy. Also, the US, China and the EU seemed to be immovable in trying to reach an agreement. Especially the EU who promised to deliver a part of their fossil fuel taxes into the Green Climate Fund if the US and China would support their idea and conduct the same strategy. On the other hand, the bloc of Developing Countries took attention with their significant raise in ambition. They demanded other countries and blocs put in more effort in order to reach a better position in relation to climate justice. The results according to the proposals of countries were not as expected at the end of first day. +3.8 degrees C of temperature rise was determined in respect to countries and blocs’ proposals to their INDCs. The Secretary-General, again, urged the parties to put forth more effort. The Climate Activist group made their first visit to EU and specifically criticized China. EU demonstrated unproductive attitudes throughout the day. Fossil of the Day Award went to the Developing Countries. The problems such as inundation of islands and climate refugees could not be completely solved yet. Day 2 started with a protest from the activist group with slogans such as “Attention, we are melting” and “The ones who create problems cannot solve these problems” that echoed in the negotiation rooms. The Parties started their speeches after the protests. Day 2 was like Day 1 as it remained weak for solving climate problems. Necessary steps could not be taken. The parties accused each other rather than searching for ways to cooperate. In particular, the representative of the Developing Countries rebuked the rest of the Parties. They indicated that although the weakest circle is the developing countries, other countries and blocs do not adequately contribute to the process and give unrealistic promises which remained at the very low levels. At the end of the day, one of the important criticisms was stated by the EU which indicated that each Party talked about money but no one proposed how to use this money. During Day 2, one of the observations was that the countries and blocs acted in accordance with their own interests instead of a collective interest. Nevertheless, +3.8 degrees C was decreased to +3.5 degrees C in accordance with the analysis of the proposals of countries and blocs at the end of Day 2. Preserving temperature rise under +2 degrees as a target was still far away and current conditions would keep influencing all living creatures. Activists’ protests throughout the day took attention. After two disappointing days, Day 3 was a good day for possible collaborations. The countries and blocs were calm and presented reasonable proposals compared to previous days. Rather than accusing each other, the Parties were more creative and expressed their tendency towards possible collaborations. A surprising proposal of the US was in the form of a 45-billion-dollar contribution. Nevertheless, the US created disappointment as it did not give satisfying explanations for its close relations with the fossil fuel industry. The star of Day 3 was renewable energy. The Parties seemed to be agreed on the advantage of investment in renewable energy but they were not clear about how to invest in it. This uncertainty allowed the fossil fuel lobby to accelerate its campaigns and try to take advantage of unemployment problems of the countries and blocs. A video which showed secret talks between activist groups and the fossil fuel lobby was leaked. China made efforts to have close contact with other Parties. The Developing Countries maintained their strong stance. Day 4 was the day for the foundation of various collaborations. It was heard backstage that the US and China agreed on specific dates to start preventing and decreasing their carbon emissions. The active position of the fossil fuel lobby was another issue to mobilize around backstage. The activist group remained passive at this point while fossil fuel actors were actively lobbying. The Parties delivered their final speeches and presented final proposals for their contribution. The focus of Parties was again on the importance of investment in renewable energy on the last day. The stars of the last day became China, India and the bloc of the Developed Countries while the US, the EU and the bloc of the Developing Countries were facing with criticism by various actors. Temperature rise was decreased to +3.0 degrees. Although there is no major improvement, it was still possible to obtain some small achievements since the Paris Agreement. However, the Secretary-General emphasized that there was still a long way to go. The organizing team and participants succeeded in implementing four fictional days of the World Climate Simulation within a day. 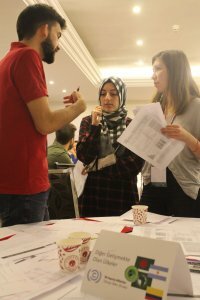 While the organization team was happy to see concrete results of the program, the participants enjoyed discussions in the simulations and have contributed to the future of world climate. Now, the turn for contribution is ours as climate trackers. The participants will go back to their homes and start working on the implementation of new simulations. Dates for these simulations have not been decided yet but they are planned to be organized in the next few months. Follow the social media accounts of the Change for Climate Project (C4C) for updates. It is the time for change. Not the climate, but ourselves, our families, our friends, our society, our country and companies by a just transition.